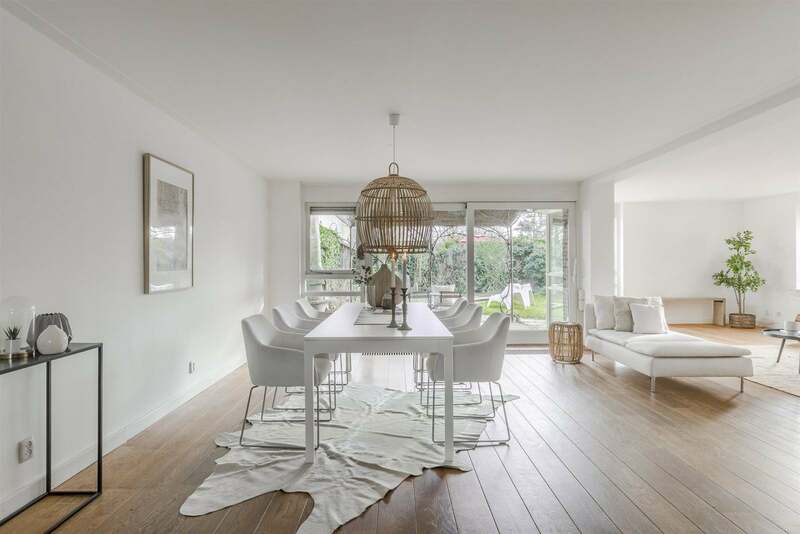 A very attractive spacious light family house nearby beach on a quiet location in cosy village Muiderberg for a year round holiday spirit and also nearby Amterdam (15 minutes by car). The house is very well maintained and well finished. It has 5 bedrooms, a garage and office space. The back yard is located on Southeast and has 2 private parkings on the front side. Within walking distance of the “IJsselmeer-strand” with several water activities. Train station Weesp and Almere Poort are easy reachable (10 minutes by car) and also good bus connections. Entry, hall, staircase, toilet with sink and entry to open kitchen with appliances and connecting to dining room. The spacious light living has a beautiful fire place. The groundfloor has wooden flooring. Through the sliding doors in the living you can reach the private sunny backyard (145m2) located on southeast and has a roofed terrace. From the hall the storage/hobby space and garage are reachable. The annex with office space has a separate entrance from outside. Landing and 4 bedrooms. The large bedroom has a built in closet. The modern bathroom has a Jacuzzi, walk in shower, toilet and double sink. This floor has laminate flooring. Landing with second bathroom with shower, sink and connection for washing machine and dryer; 1 Bedroom; Extra space for storage and technical systems (boiler). The roof terrace is located on Southwest and is reachable via landing. - Public transport easy reachable. - Final cleaning costs will be charged. This advertisement has been composed with the greatest care. Nevertheless, photographs or text may differ from the actual situation.